Imagine inquiring, knowledgeable and caring young people who help to create a better, more peaceful world through intercultural understanding and respect. Developing such students is one of the main goals of the International Baccalaureate Organization (IBO). The IB’s programs encourage students across the world to become active, compassionate and lifelong learners who respect the different perspectives of others. The IB’s educational philosophy fits well at UCC — it emphasizes comprehensive, balanced curricula and challenging assessments that develop individual talents. It also endeavours to relate classroom experiences to the realities of the outside world. The UCC Preparatory School is fully authorized to deliver the Primary Years Program to its students. The PYP focuses on the development of the whole child as it strives to prepare students to be world citizens and lifelong learners. The curriculum is designed to meet the academic, social, physical, emotional and cultural needs of young students. At the heart of the PYP is a commitment to “structured inquiry” as a vehicle for learning. Through inquiry, concept-based questions are used to explore curricular themes and to help students to make significant connections. As boys enter adolescence, they become more aware of their talents, strengths and weaknesses, and they are more curious of the world around them. They start developing values and making choices that will shape them when they become adults. They are increasingly eager for independence, and yet need clear expectations and boundaries. While they are beginning to define themselves as individuals, peer relationships and meaningful relationships with adults are becoming more important to them. They are also better able to think critically to solve problems, see meaningful connections and make inferences. 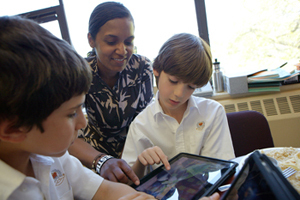 Our Middle Division curriculum follows naturally from the SK-5 Primary program. It meets the standard of a world school program and provides a solid and exciting transition to the Intermediate Years 1 and 2 at the Upper School. This program meets the social emotional needs of our students and enables them to become responsible, independent, curious and creative thinkers and learners. It recognizes the importance of learning styles, intercultural understanding and a transdisciplinary approach to learning. It insures that our boys are actively engaged in a rich spectrum of academic, artistic, athletic and service activities in a supportive environment that encourages risk-taking and fosters their sense of achievement and self-esteem. For more information about the Prep's academic programs, please consult the Prep Family Handbook or the IBO website, www.ibo.org.